Bosch has come out with a new cross-line laser level, the Bosch Self-Leveling Cross-Line Laser with Plumb Points GCL 2-160. 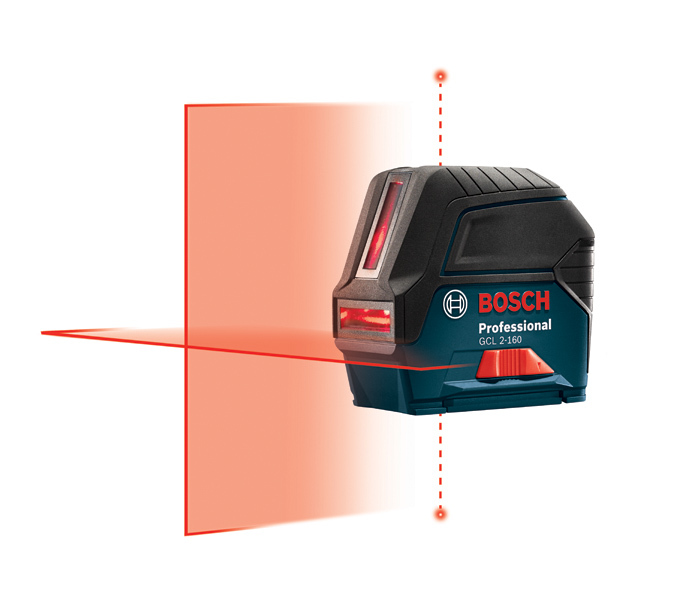 The new Bosch GCL 2-160 self-leveling cross-line laser with plumb points features dual self leveling lasers that can cast a horizontal and vertical line together or indepentantly. 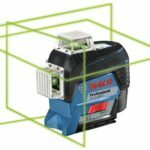 The laser has a visible range of up to 65ft and features what Bosch calls “VisiMax” technology that monitors power consumption to maximize line visibility and extend battery life. It uses a smart pendulum sytem that self levels and indicates out-of-level condition up to ±4°. The new Bosch Self-Leveling Cross-Line Laser with Plumb Points GCL 2-160 will be available this September 2016 with a retail price of $179.00 USA price, and $229.99 Canada price. Mt. 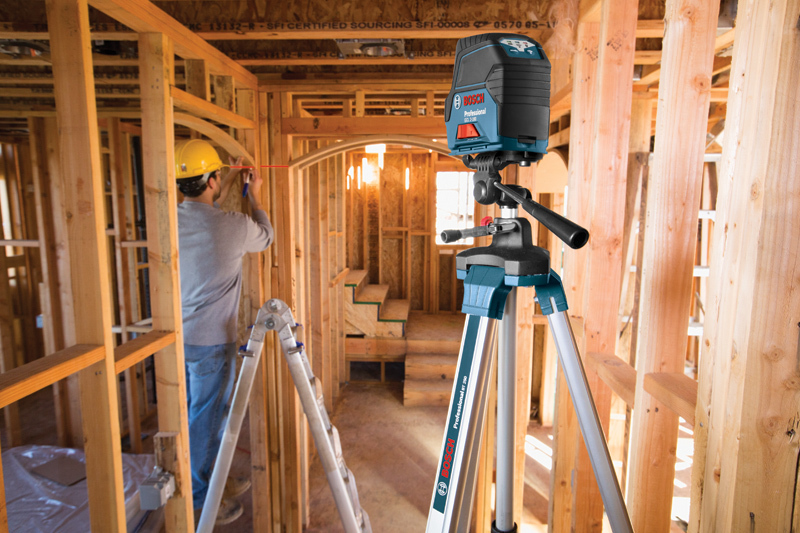 Prospect, Ill., August 16, 2016 – For the construction or carpentry professional looking for maximum versatility in an easy-to-use leveling solution, the answer is the Bosch GCL 2-160 Self-Leveling Cross-Line Laser with Plumb Points. 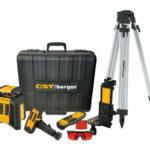 This all-in-one unit offers a high-visibility cross-line with two up/down laser points. The lines and points can be turned on independently or together for horizontal level, vertical level and plumb transfer applications. The laser has a visible range of 65 ft. and accuracy of 1/8″; the receiver mode allows it to work with optional Bosch line laser receivers (LR 6 or LR 7) for a working range of up to 165 ft. The unit has suitability to work both indoors and outdoors. 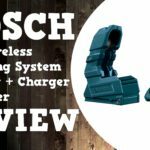 And the laser has Bosch VisiMax™ Technology, which monitors power consumption to extend line visibility time and battery life. The Bosch GCL 2-160 Self-Leveling Cross-Line Laser with Plumb Points is ideal for the multi-function user who works a variety of jobs involving leveling, aligning and plumbing. It has manual mode to lock lines for use at any angle. And the Smart Pendulum System self-levels with an accuracy up to ±4° and indicates out-of-level condition with blinking laser lines. 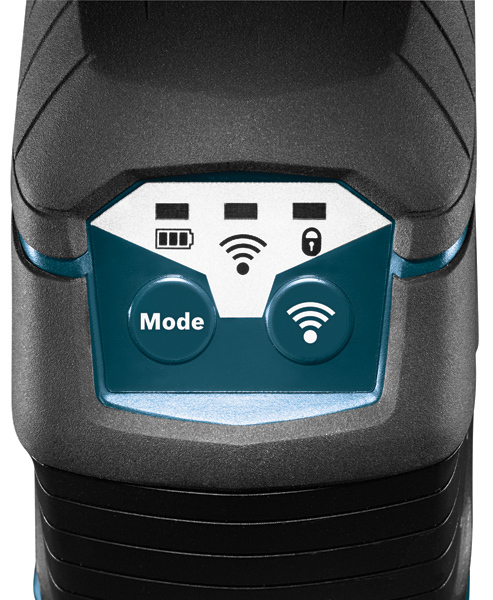 It provides two highly visible lines and pulse functionality to work with optional Bosch line laser receivers to extend the working range. The GCL 2-160 includes the RM 1 Magnetic Rotating Mount, which rotates 360° and positions the vertical line to keep the unit centered on the plumb points. In addition, it has built-in magnets that secure it to metal surfaces. It’s well suited for ceiling installations, especially with the included ceiling grid clip. It has a slide-in locking base for quick and easy setup. The Bosch GCL 2-160 has a pendulum lock, which protects the laser diodes by locking the diode in place for use in angled applications, during storage or transport. The LED battery status is located on top of the tool for added user convenience. The unit offers robust over-molded construction built to the IP54 standard, which ensures splash water/dust protection for years of dependable operation. The Bosch GCL 2-160 Self-Leveling Cross-Line Laser with Plumb Points comes with the RM 1 magnetic mount, a ceiling grid clip, a hard carrying case, a laser target plate, and three AA batteries. 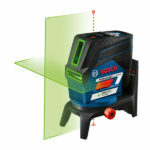 To learn more about the Bosch GCL 2-160 Self-Leveling Cross-Line Laser with Plumb Points or to find a local dealer, visit www.boschtools.com or call 877-BOSCH-99. Check out www.bethepro.com for additional tips and videos.